Yes, folks…it IS happening. 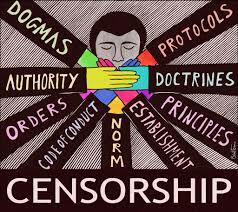 all over the world, humans are all becoming censored for what we say and how we think if it does not NOT follow the established party line of the prevailing government! That being said, please be aware that there quite a few different places on the Internet where you are now (at least, for now) able to post exactly how you feel with little restriction. These “alternative sites for alternative media” are listed below. This entry was posted in Uncategorized and tagged alernative sites for alternative media, censorship, Internet sites, love. Bookmark the permalink. The globalist agenda is designed to shut off all opportunity for any opposition to their authoritarian fascist designs and plans. It will NOT work.